"It's scary," said AnuPama Ramalinga, an Indiana State University doctoral student from Bangalore, India. "Is it okay to fall?" Group leader Bryan Alexander reassured her. "It's a trust thing. People will catch you." She stood atop a platform five feet above the ground; below her, two rows of students stood with arms outstretched, forming a bridge. In an act of faith, she leaned back with an anxious smile as she nervously but excitedly fell back into their arms. Luckily, it was a trust fall, with many hands ready to catch her. It was just one of the events which Alexander, a recreation and sports management major from Indianapolis, led his group through during the international team-building event at ISU's field campus in Brazil. The event lasted for several hours on a brisk Saturday afternoon earlier this month. The purpose of the event was to provide international and domestic students an opportunity to interact with each other and work collaboratively while having fun and making new friends, said Zachariah Mathew, associate director of International Programs and Services at ISU. The program utilized outdoor activities to promote interpersonal skills, cooperation and self-awareness, he said. "We're taking a group of international students through team-building exercises and challenges," said Steven Tuttle, an instructor in the ISU department of kinesiology, recreation and sport, who served as a group leader. He noted that students participated in large-group games before splitting into smaller sections for activities such as canoeing, climbing a wall and a high ropes course. "We had the team-building activities. We met new friends," Ramalinga said. "We bonded with different cultures." More than 15 countries were represented by nearly 40 students, both international and domestic, during the daylong event. A handful of graduate students from the student affairs and higher education program were also invited to participate as an introduction to the field of International Student Affairs. "It's good to get everybody together, from different cultures and with different activities," said Daniela Baez, a doctoral student from Ecuador. Nearly all of the day's activities presented some kind of obstacle for students to overcome. During one team-building exercise, 11 students lined up on a log. The challenge was to put themselves in order based on their birthdays, though they could only step on one rock and not elsewhere on the ground. After a few minutes of strategic movement, students ended up in the correct order, which participant Ragini Gupta noted was possible for several reasons. "Strategy, making a sound plan," she said. "We had good communication." Gupta, a student from Rajasthan, India, who is currently working on her second master's degree at ISU, said one of her favorite aspects of the day was meeting the students who participated. "I did make new friends," she said, mentioning a variety of students from China, Switzerland, Jordan and Algeria. Pedro Ramirez, a language studies major from Los Angeles whose family is originally from Mexico, agreed, as he met event participants from Ecuador, India and Taiwan, among other countries. The new friends provided support to one another as they worked as a team. "You're relying on one person as much as the next," Tuttle said. The group's teamwork and interdependence led to new friendships. By the end of the day, they left the field campus as a community, Mathew said. As a group leader, Tuttle said that one of his favorite parts of the day was pushing students to reach new limits, such as encouraging students to climb higher than they initially wanted to on the climbing wall. "I'm Pedro," he said, "and I'm ready for this challenge." 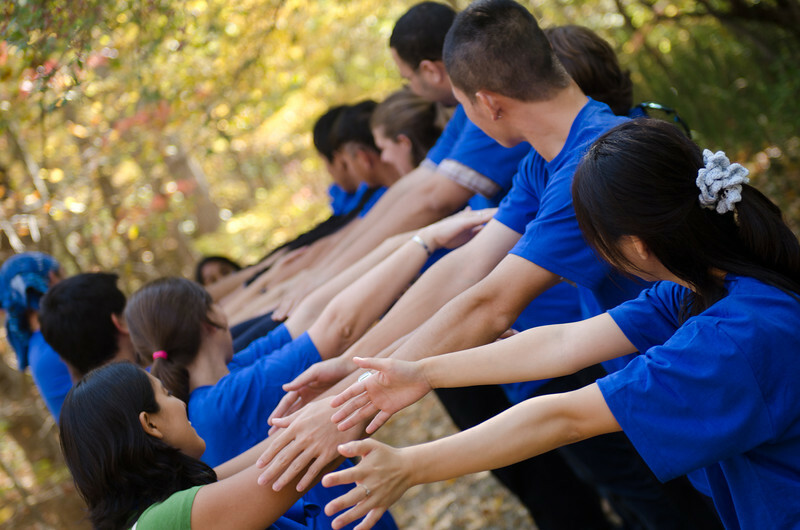 Students have their arms outstretched during a team-building event at the field campus of Indiana State University in Brazil, Ind. Nearly 40 international and domestic students from ISU participated in the daylong event earlier this month. A student falls back in a trust fall as students wait to catch him. The activity was part of a team-building event that took place at the ISU field campus in Brazil, Ind. About 40 students representing more than a dozen countries participated in the event. Students participate in a team-building exercise during a team-building event at the ISU field campus in Brazil, Ind. About 40 international and domestic students from Indiana State participated in the event. Contact: Zachariah Mathew, associate director, International Programs and Services, Indiana State University, 812.236.2439 or zachariah.mathew@indstate.edu. Writer: Bethany Donat, media relations assistant, Office of Communications and Marketing, Indiana State University, 812.237.3773. Nearly 40 domestic and international students, representing more than 15 countries, participated in the team-building event at the ISU field campus in Brazil earlier this month.